What’s in the Bath Water With My Baby? There’s something indescribable about bath time: the way a small child looks glistening wet, the smell of his damp hair, the sound of giggles and splashing against the acoustics of ceramic tile. It’s a bit enchanting. I was immersed in the contentedness of it all the other night as I sat by the tub watching my son. Like usual, he was hypnotizing himself with the motion of water by repeatedly filling a wooden bowl and slowly pouring the water out. Inevitably, he stops to take a drink. Like many toddlers, he loves drinking his bath water. I’ve watched him do it countless times, but this time the proverbial light bulb went on. We’re so careful about what we feed him and the beverages we choose, but somehow this innocent moment of ingestion had never crossed my mind. Bath time is about purity and cleanliness. Since we use natural and non-toxic bath wash and shampoos, we had nothing else to worry about, right? Unfortunately, no. First of all, and perhaps the most obvious fact is that, while American tap water is some of the cleanest in the world (depending on where you live and whether you are drawing from a public source or a private well), there can still be contamination. An Environmental Working Group study of national tap water quality in 2005 found more than 140 contaminants with no enforceable safety limits. Secondly, drinking the bath water is not the only way your child may be exposed to contaminants in it. As the water evaporates (and this is much more of a concern for showers), your child can inhale contaminants. 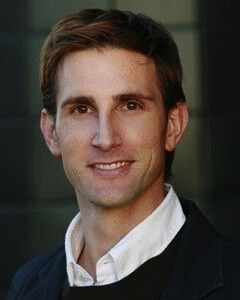 In fact, according to the American Chemical Society, “we could receive from 6 to 100 times more chlorine by breathing the air around showers and baths than we could by drinking water.” Also, your skin is porous (and especially so in warm water which opens up pores), so dermal absorption is another route for contaminants to find their way into your child’s body. 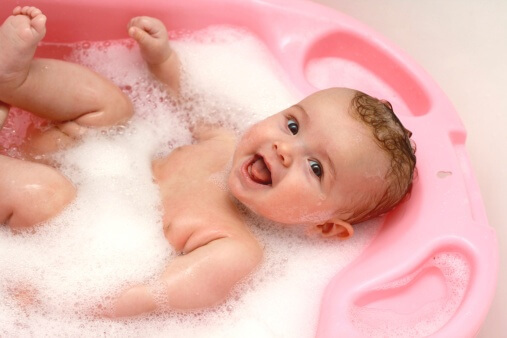 If you’ve cleaned your tub recently with a conventional cleanser, and you haven’t rinsed it well enough, chemical residues can end up becoming a part of your baby’s bath water (which as you can guess by now – can end up being absorbed, inhaled, or ingested by your baby). So, skip the tough stuff and get a natural shine by either buying non-toxic cleaners or using simple ingredients like vinegar, baking soda, and lemon juice. So the next time your little one jumps in the tub for her nightly scrub-a-dub, keep it even cleaner by filtering your water (or at the very least – discouraging your child from drinking it). There are great small bath filters that can hang from the tub’s nozzle that remover chlorine and other water contaminants. Be sure to use natural and non-toxic bath products and lotions. And finally, after they are all clean and jump into a fluffy towel – well, what was it cleaned with? Avoid those harsh conventional laundry cleaners, opt for non-toxic softeners and dryer sheets, and skip the chlorine bleach. Now where’s our PVC-free yellow duckie hiding?